Even rappers have a set of guidelines to live by. Our friends at XXL have published a new set of commandments – a list of 15 things EVERY artist must do to become and STAY successful in the game. The commandments range from common sense (hopefully) with “Stay Out Of Jail” and “Think Before You Beef” to the more industry-specific items such as “Don’t Let Your Record Label Be Your Management Company”. There’s a reason Tech N9ne can tour almost all year long: he’s an amazing performer who has earned a rep for tearing down every venue he sets foot in. The days of an R. Kelly hook or a Neptunes beat helping a rapper sell millions of albums are over. Successful artists today are the ones who get out on the road and win fans with their sweat. The rap gods have spoken. 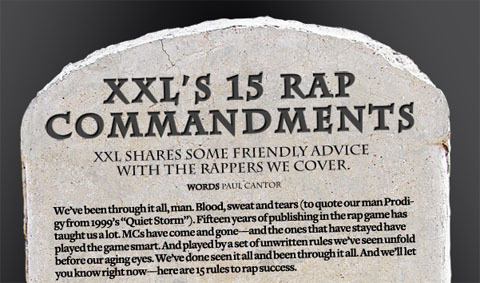 Click HERE to read all 15 commandments from XXLmag.com or check it out in the September 2012 edition of XXL Magazine. Do your favorite artists follow these commandments?